Gas logs designed to look like a real wood-burning fire are what Real Fyre Charred Oak Gas Logs by Peterson are all about. The realistic, partially burnt exterior gives you the impression of an actual fire burning away in your fireplace. To add to the authenticity, the bottom log is 'burnt through' and allows you and your family to look inside the fire to see the flames and embers within. These gas logs not only look great, they are built to last thanks to the high-quality materials used in construction and the steel reinforcement rods. Peterson is the most trusted gas log manufacturer around for a reason. Take advantage of their skill and know-how, get a realistic look, and get the right value for your money with a set of Real Fyre Charred Oak Gas Logs by Peterson. Are the logs of this Real Fyre 18" Charred Oak vented natural gas logs set secure or am I able rearrange the top logs? As is the case with all gas logs, they have to be arranged per the manufacturer's instructions to prevent flame impingement and the potential release of harmful gases. How do I vent this unit? This set must be installed into a masonry fireplace in good condition or a prefabricated fireplace with an 8 inch or larger chimney system. The set should not be used in a B vent prefabricated fireplace. Do the embers come with this set? Yes. A bag of ceramic embers do come standard with this set. When placed amongst the front ember burner, they will produce a glowing effect that mimics the look of authentic coals. How many years does this set last? Is there a warranty? The Real Fyre logs are manufactured from high quality refractory materials. They come with a lifetime warranty against degradation and breakage. The match light burner assembly is warranted for a period of 10 years. Does this log provide heat to the home? 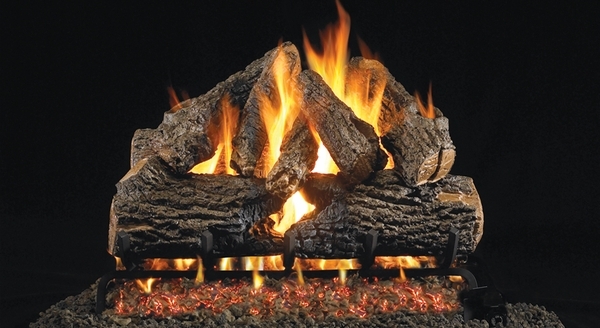 Vented gas logs are primarily intended for ambiance and will provide only limited supplemental heat to the immediate area. Easy to read instructions and prompt tech help. The experience with eFireplace Store was terrific. The logs shipped quickly, were very easy to install and look very real. I suggest purchasing the lava rocks at the same time for more realistic appearance. I am adding those now. Overall very pleased with this purchase and wish I had converted to gas logs many years ago. Easy ordering. The size guide helped me pick the correctly sized log set for my firebox. The videos of the fire burning made it very easy to pick the log set we liked the look of best. Delivery was fast and smooth. Set up directions were very easy. The recommendation to add the bright embers and crackler make for a very realistic fire. The price was the best I have found anywhere. A very smooth e-buying experience. Thanks for making this process so easy and clear, every step of the way! Arrived on time�Ÿ˜Š we haven't installed yet. But very impressed with the realistic look of the logs. Just had this installed and it looks good and work well. The firelogs are awesome. They burn realisticly and are cozy to sit in front of. I�€™ve installed these gas logs before and love them. They�€™re easy to install and look realistic. Just installed my log set today and it looks beautiful. Very happy with it. The charred oak looks very natural. ProsEven though most logs we were able to figure out it would have been nice if they had been labeled (showing numbers) in the box they came in. Real Fyre vented log set review. An excellent log set that was delivered in two days at a great price. Ease to install and it works great . All pieces intact and accounted for. Directions were GREAT, except log placement- had to modify it just a little to fit on the grate. Good quality and we are loving the heat and visuals of this fireplace set. My 96 year-old mom is so happy with it. Thanks! Put in ventless logs 7 years ago & could not hardly use due to heat output. Finally let wife talk me into replacing with a vented set that we could actually turn on and enjoy. Efireplace.com answered all my questions, very friendly/knowledgeable staff. Ordered Wednesday morning at 9:00 a.m. had them installed by Friday morning at 11:00 a.m., just in time for Christmas weekend. Turned on & WOW! Beautiful set, looks real with lots of burning embers & dancing flames. Great purchase, great looking set of logs, excellent customer service & fast delivery! BTW, these vented logs do put out some heat, but nothing compared to a ventless set. Family loves the ease and conveniently of not burning real wood. Logs set realistic look and dancing flames make for great replacement of wood. Everyone in family loves the realistic fire and embers. No mesh and easy turn off gas before bed. The only way to go. Beautiful design and it keeps the room warm too- we love it! 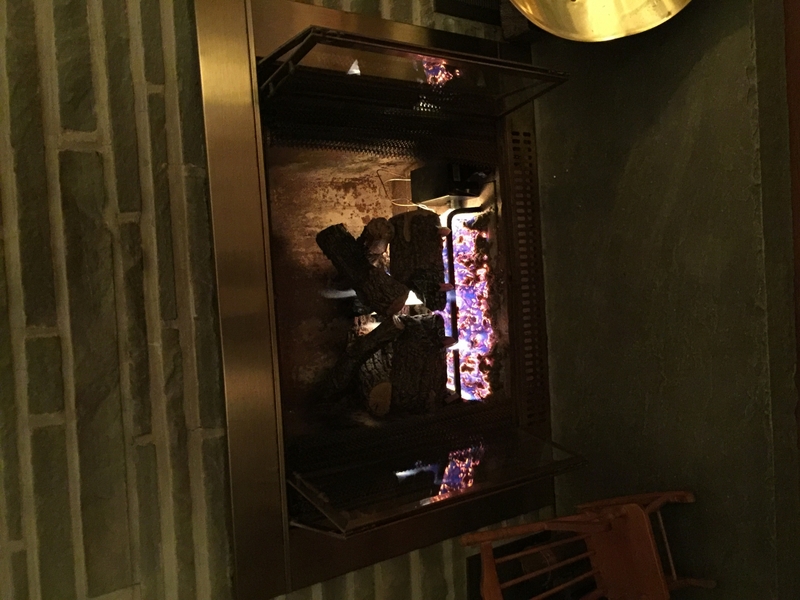 I installed this gas log set in my "Heatilator" style fireplace. After cleaning the chimney and having a plumber install a gas line with a remote shutoff valve I installed the gas log system just like the instructions specified. Previously I had been burning oak in this fireplace and it did develop a roaring fire with large random flames. This new gas log set produces the same roaring flame with the same realistic random flame variations and glowing embers. It just looks like a real fire and the variable flame remote works great. Ordering the logs was simple and easy. They were shipped out the same day and were received in two days. Installation was quick and simple with detailed instructions. Install went smoothly. Easy to follow instructions. Looks very natural. Most important, the wife is happy. Love the log set. You have to move the logs around a couple of times to get it right, but once you get it, they look great! Great lookIng fake logs and they shipped really fast. I love this set of gas logs! Their appearance is very detailed, and with the fire lit up, they look as if they are actually burning. My brother assembled the set-up for me, which he said was easy to do with the clear instructions. We both liked the way the fire is evenly spread under the logs and the "embers" glow to give the full effect of a real fire. Additionally, the prices at the eFireplaceStore are great, and their customer service is very helpful I highly recommend the Real Fyre brand, the eFireplace Store, and this particular set of gas logs. I really like the way it looks and works. This is a real looking set of fire logs was very easy to install and it produced more heat that I expected. Would recommend a buy on this one. ProsLogs look real and the glowing embers light up real well. A cozy addition to our home! Our log set was easy to install and has been a real lifesaver this winter. It looks relatively real and is very easy to use. We are very pleased with our purchase and look forward to cuddling up by the fire this winter. Just in time for the cold front! 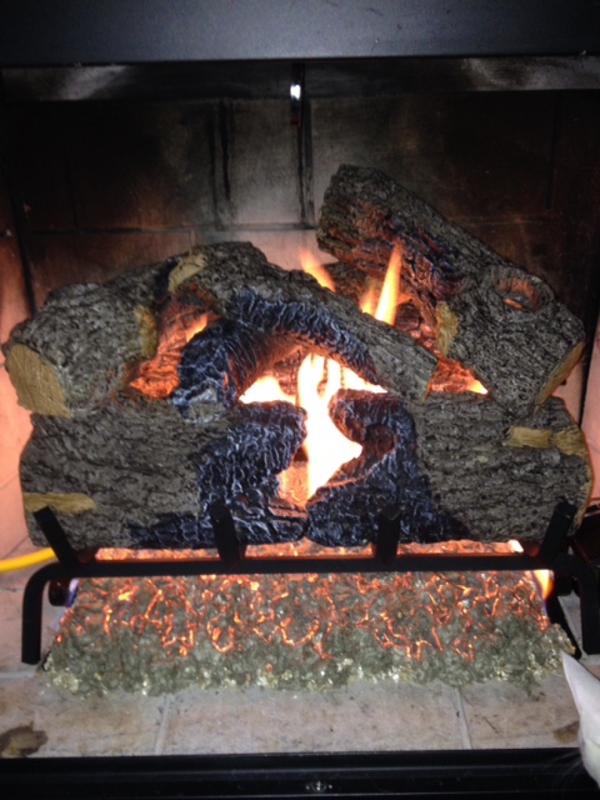 My neighbor ordered from eFireplaceStore and I loved her logs and embers. It looked so natural. I immediately went home and ordered my own! With the turn of a gas key and a quick light our living room is warm and cozy. I would highly recommend the product! I order two gas log sets for my home. All parts arrived within days of ordering and completely undamaged. Installation was easy and the product looks beautiful. Very happy with log set and quality. Best quality and price. Very realistic! Just what we'd been looking for. This log set is the best I have owned. The split log look really makes the fire look realistic. The number of logs makes for a nice presentation of the fire and the firebox. Excellent customer service when ordering. Quick shipment/received days before promised. This is the real deal. Very life-like. Flames and wood authentic. Easy to install. Great look from both sides - living room and den. Installation easy. 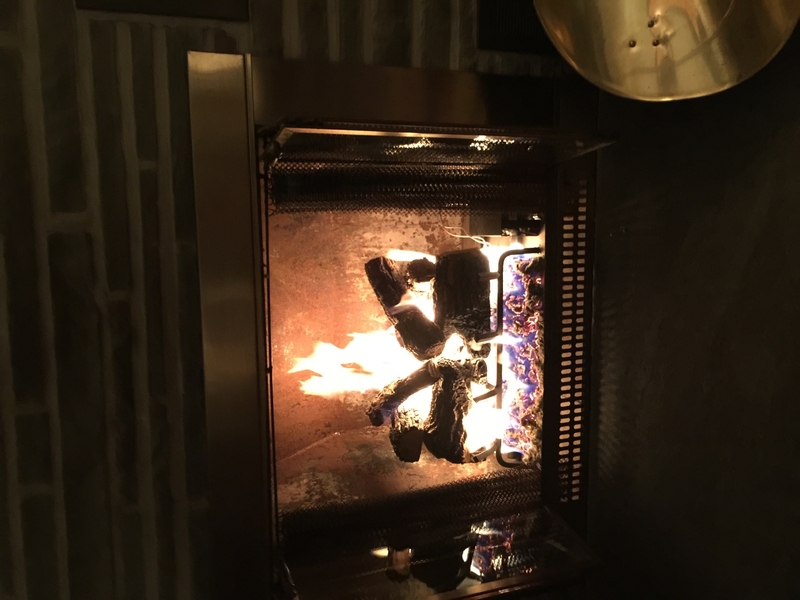 ProsQuality exceptional - from both sides of a see-through fireplace Really adds to fall and winter evenings experience Good value for price Installation easy. Easy to install and looks great. I added some quarter inch to half inch black cinders from the landscape supply around the burner pan to finish off the project. The product arrived as promised in excellent condition. Assembly instructions were easy to understand and concise. Product looked of high quality. Other than briefly firing it up to see if all works properly I can say it has an outstanding appearance....it looks real. Since it is summer and very warm in Florida, I will have a stronger opinion when cooler weather occurs and we use the fireplace more. Very realistic looking log set and very good quality. Cons The big log had a crack on the backside, not visible, probably caused by UPS, still I was not impress with the packaging. Consider added padding in your boxes. Purchased this set of fireplace logs and I must say that we have been very pleased. The fire looks very realistic. Recommend the purchase of this set to anyone. This log set is FAR superior to my previous gas logs. They look pretty darn good. The firelog was easy to install. It looks very nice. We previously had a Peterson log, so we knew it would look nice. The directions are easy to follow. We LOVE our charred oak fireplace logs. They look so real and are beautiful. They arrived in two manageable boxes and in perfect shape. It took only a few days to get them. We had a plumber install them as recommended. Everything needed was included. The person we talked to at eFireplace Store before placing our order was knowledgeable and helpful. We would highly recommend them. 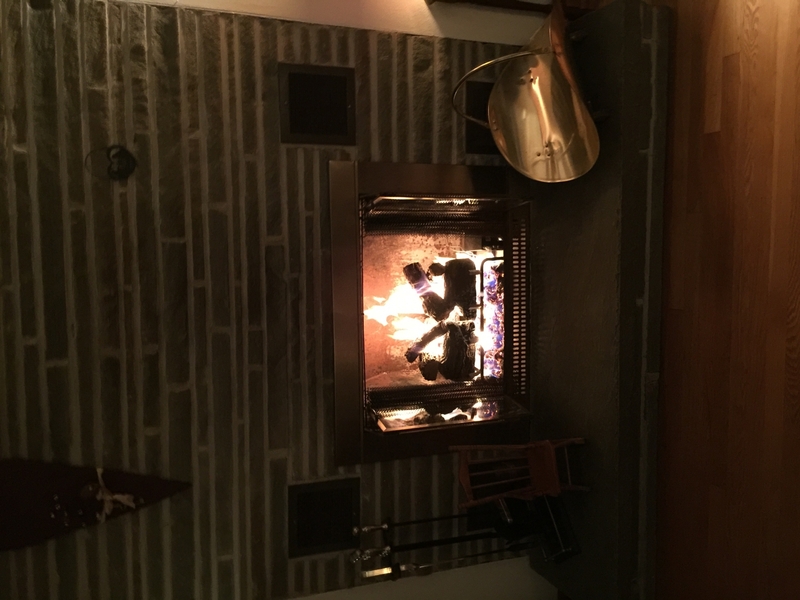 I have used actual wood in my fireplace for the last decade, but after everything started to smell like smoke in the house (and all the cleaning that comes with real wood fires) we decided to look for a good gas log fireplace. I did not expect the fire to look as realistic as it did. The convenience of being able to turn a fire off is something that I'm sure wood burners will understand. I am glad we made the switch. If you want realism in a gas fireplace, I would highly recommend this model. Not only does the fire look very natural, but there are numerous videos about how to install the unit. After the videos, installation was simple to do myself. If you are unsure about whether to get gas logs in your home, I would encourage you to make this your first set. The wonderful ambiance that these logs add to our living room makes us want to curl up in front of the fire for the entire evening. They are beautifully well made, and there produce whatever amount of heat that you need. I would buy this again in a heartbeat. We haven't needed to use the fireplace yet this fall, but the logs look very realistic. It is amazing how much cheaper buying gas log sets online. If you were to go to a local store, you would easily be paying over a hundred dollars more than here. When we got this set, it took a few minutes to fully set up. If you are thinking of buying a gas log unit, don't shop locally. You will get a better price online and they are of the highest quality. If you are going for an ultra realistic look, I would advise you to get the embers with it too. Installation is a piece of cake. I am used to actual wood fires, so I was cautious when shopping for a gas log set. No one that has come to my home has noticed a difference between the two. After deciding to get a gas log fireplace, I checked my cities regulations regarding using them in an apartment. After discovering that there are a lot of them, this fireplace set was the only one that I would be allowed to use. Since I was forced to buy this one, I was a little nervous at first. But, after getting it and setting it up (which took a while considering my non-woodsy upbringing), I could not believe how great this model looks. The fire is very realistic, and I decided to get the logs with the fake charring on them. With the char you can't tell the difference between this and a real fire. Also, dealing with customer service was a very pleasant experience, and I would buy from them again. The packaging that the log set arrived in is very sturdy. Nothing was damaged when it arrived. I was surprised by how high the flames can get, but the heavy-duty construction is very appealing. After years of burning wood fires in our fireplace, we decided to make the switch to a gas log unit. Shopping locally turned out to be a huge disaster. It worked horribly and was returned very quickly. Once we looked around online, we eventually decided on this model (and we bought the glowing embers kit as well). The only problem we had was with some pieces of the burner (the directions could have been clearer there). After getting it together, I am amazed at the realism the fire provides. I can also say that the embers are totally worth it! This unit keeps us very warm, and we actually enjoy using the model with match light (it makes us feel a little bit more like we are getting a natural fire, with none of the mess). The burner we bought in this unit makes the fire look very natural. The logs also make it seem like you are sitting in front of a real wood fire (with looks and warmth). I would caution you to find out whether a log set will fit in your fireplace before you buy it. This model is great for putting in a smaller fireplace. I have been a long time supporter of this company (I worked for them for quite a while during my university days), and I am pleased to see that they have not sacrificed an inch of quality or realism in their gas log units. The charred look that this set comes with really gives an impression of a natural wood fire. It is also manages to deliver all of these qualities for a fraction of the cost of similar models. During Christmas, we all gather around the fireplaces and really enjoy basking in the warm glow of the flames. I would recommend getting a gas technician out to help you determine how much pressure you have in your gas lines. Ours was a little weak, so our flames don't get as high as the flames in this unit should. Eventually we will get a technician out here, but I still think this unit is great in our home. Gets you the feeling of a natural wood fire without all the mess and smells that entails. It is a high quality product. The lack of cleanup is very attractive in gas log units, and this model is no exception. A natural flame and beautiful design make it a sure buy. I love this Log Set. It was pretty easy to assemble. It looks Great. The price was right. Customer service was great. Delivery time was outstanding. Directions were pretty easy to understand. I have already recommended it to some friends. The model with vented flames looks much more realistic than the other units. Installs easily and quickly. Don't bang the logs around too much or you will damage them. It does take a little while to get the logs just right. If you are planning to switch from wood fires to gas fires, I urge you to take the plunge. Simple to put together and install, you can barely tell the difference between this and a real fire. I don't think that you can get a good impression of just how realistic the fire is in this unit until you actually try it for yourself. The charring on the log set is unbelievably realistic, and the burner that comes with this set makes it feel like a real fire. My previous gas log fireplace had the most pitiful flame you could imagine. Once I purchased this model and set it up, I was blown away by the amount of heat and realism this fireplace provides. As with all gas log fireplaces, I recommend using a carbon monoxide alarm in whatever room you install it. If properly close all the gas line attachments, you shouldn't have any trouble. Keep in mind that although you will be warmer, it will cost more on the gas bill. That being said, I love the new look of our fireplace. The logs really make it look like a natural fire, and the room stays cozy. Make sure that the unit will fit in your fireplace before buying (it is just right for ours), but it is easy to install. We think it was a great decision to make the change over to a gas log fireplace. 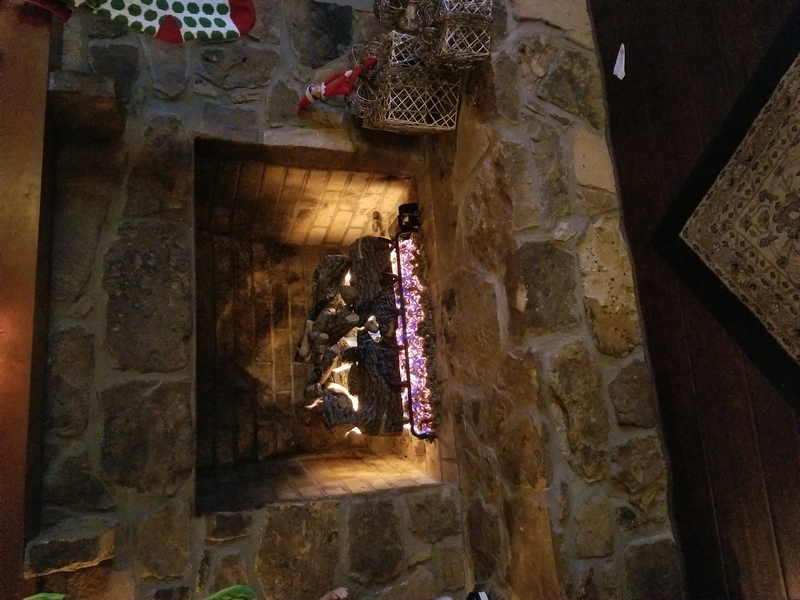 After about half a year of using the fireplace originally in our home, it did not function properly anymore.I shopped for a set that would look like a real fireplace, and would heat the house well. This model did the trick! Since we didn't want to put up with the mess that a wood fire makes, we bought this model of gas log fireplace. I could not believe how much the charred logs and the flames make it look like a real fire. Fits my fireplace like a glove. I got it installed very quickly and without hassle. It may not be inexpensive, but you definitely get a great product for your money. Thanks to helpful customer service videos, putting the fireplace together and connecting the gas were extremely simple. Very realistic flames. After you get the logs and embers set up as you like (take your time and it will look fabulous once you are done), you will be amazed at how realistic this gas log set is. My logs don't look as good any more (I haven't cleaned them like I should), but it is supposedly very easy to remove the soot deposits. It is amazing how much more realistic the fire is with the embers you can get, so I definitely recommend those. This gas log unit made our fireplace the center of the dor. It was so easy to put together, and it produces a beautiful flame.